The concept of video game design and architecture has been expressed by several academics and yet within it there doesn't seem to be much room for Randy Balma: Municipal Abortionist. As game designers and consumers continue to explore the world of games as art, inevitably lines must be drawn in the sand on what distinguishes these games from more mainstream products. Just as art is not confined to being strictly about making people happy or awed, neither are games confined to personal fulfillment or easy rewards. Such fun and easy games are designed to appeal to as many people as possible, but what the art game movement has begun to establish is that games can enjoy a smaller audience for the sake of going beyond such incentives. Randy Balma: Municipal Abortionist is a prime example of a game experimenting and pushing the boundaries of the video game world with no concerns about explaining itself or fitting into any simple niche. It is about creating an artistic experience for the player. Created by Mark Essen, more commonly known as messhof, the game consists of four loosely conceptualized levels. 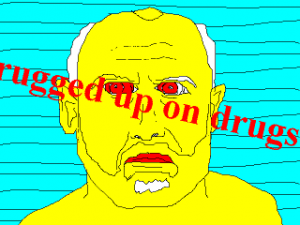 The game begins with a single cutscene: a drawing of a yellow old man with red eyes and a shifting background. The phrase, "I feel like I been awake before but I can't be sure and I'm drugged up on drugs and I think they are affecting me" rolls across the screen and then you're off. The opening level is a disorienting drunk driving experience, the second involves a clock tower crashing into satellites, the third takes place in zero gravity, and the fourth involves a tentacle monster made of baby parts. messhof explains in an e-mail, "It puts you in a weird place when you see that and start the game. Some of the future mechanized megabortion stuff [in earlier versions] still comes through and you can make connections in other places, but I don't mean it to be too literal. It's more like 'you don't have any power, you're just some bottom rung dude and you're going to have to do some stuff you may not be that comfortable doing.'" There is never an explicit moment where you perform anything like abortion in the game, but using the word to induce the mind frame of loss and innocence prepositions the player experience. It makes one think about the smashed cars, satellites, and ultimately the tentacle baby monster in a manner that crosses over to the surreal. These elements exist alongside multiple layers of visuals to help reinforce the experience. It was long ago discovered that video games could induce vertigo and motion sickness, but few have ever utilized them within the game design. messhof notes, "There are what I hoped to be nausea inducing aspects in all of the levels, mostly coming from the smoke and constant camera rotation. I wanted these to become more and more under your control as you progressed in the game, for example the drunk driving level is completely out of your hands, with a constant camera rotation and unavoidable accidents. The rocket ship level puts you in the perspective of the rocket, which you have total control of but there isn't much going on around you so it's easy to lose your bearings. Each adjustment you make sends out billows of smoke that obstruct your view. The camera on the space station level rotates left and right, attempting to simulate the disorientation of zero g." For an initial play-through, the design mostly comes across as masochistic. Your capacity to not vomit during the last level is probably the greatest challenge offered. Yet on subsequent play-throughs one begins to realize that here is a game purposefully inducing nausea in response to the player input. Even though a spinning room isn't subtle, combined with the abortion reference, it certainly is effective. It also applies photos from real life, to create a disturbing combination of pixelated art and realistic imagery. "The photographs are meant to put you out of your comfort zone a little, or just to make you take a step back and look at the scene and not just see things as game objects that you have to avoid or collect," messhof explains. The game also uses sound and music in very interesting ways. The first level consists of random noises and sounds and as you go through each level this slowly becomes more coherent and patterned. The last level consists of a loud and booming bass that adds to the nausea and leaves the player wondering about the meaning of the game all the more. messhof states, "I wanted a lot of the earlier stages to feel really ominous and strange, so Jordan and I took some of our old oscillator box material from Flywrench, slowed it down, and boosted the bass way up. The music is sort of subtle, and I don't think you really pay attention to it too much until the end, but the bass makes your body feel it more subconsciously." How does a game that is designed to induce nausea, make the player uncomfortable, and remain totally ambiguous compare to mainstream ideals? What does a game designed to sell consider itself as opposed to this? Hideo Kojima, in an interview with Edge Magazine explains, "Art is the stuff you find in the museum, whether it be a painting or a statue. What I'm doing, what videogame creators are doing, is running the museum -- how do we light up things, where do we place things, how do we sell tickets? It's basically running the museum for those who come to the museum to look at the art. For better or worse, what I do, Hideo Kojima, myself, is run the museum and also create the art that's displayed in the museum." The concept of video game design and architecture has been expressed by several academics and yet within it there doesn't seem to be much room for Randy Balma: Municipal Abortionist. messhof muses, "They're talking about videogames in the Videogames Industry sense. In that setting, of course you'd want to make games for mass appeal. It doesn't make sense to try and make an artistic game when you know you have to sell a couple million copies. Art Games don't rely on the same sorts of things because they're not intended for everyone. A game doesn't have to be a game, because it's really just a computer program. You can have things on screen interact in any way you choose. Personally, I think that it needs a certain tension between the game and the player with button presses manipulating that tension. It can just be an interactive piece of art because it's expressive of this something and engages the player in some way." This, then, brings us to the basic question of what the game's experience or meaning is supposed to be. Chris Dahlen of Save the Robot comments, "I can imagine a theme throughout the game, where an abortionist dies in a fiery bus crash and then is transformed into the afterlife into a monster -- a monster that still eats babies, but this time, it is itself a baby, which is weird." Personally, I found the game to be about the development of a creative idea. It begins with the hazed, crazy state where unique concepts are born. Each level is a symbol of the metamorphosis, the babies representing the idea itself, and the ending fits as the final horrible state where your own ideas must compete and destroy others. messhof himself, however, is a bit more tight-lipped on the topic. "I've heard it's about becoming god," was all he offered. When asked to give something to compare it to, he only said that it worked like a simulation. This is, perhaps, the most appropriate answer for a game claiming to be art. Many of the most eccentric and emotionally inspiring games are the result of happy accidents and meanings not intended by their creator. In an interview with Fumito Ueda, creator of Ico and Shadow of the Colossus, he explains that the vast majority of the reactions he reads are unexpected. He started with an image or idea and the resulting interpretations and narrative were created by the players later on. messhof's ambivalence may draw from that same realization: that video games, as with all artistic mediums, must inevitably leave the meaning and ideas up to the audience. 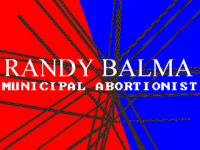 Randy Balma: Municipal Abortionist can be downloaded for free and in just one play-through will have a remarkable effect on anyone's "games as art" conversation. What makes it so great is that it often creates more questions than answers.